We are pleased to introduce this versatile machine designed for Blending/Mixing various types of powders, Seeds, granules, paste type products. Our Blending machines are most suitable for Foods Processing, Chemical, Pharmaceutical, Fertilizer Industry. Abrasives, Agrochemicals, Animal feed, Cereals, Coatings, Chemical powders, Detergents, Explosives, Fertilizers, Powders, Fish foods, Flours, Fungicide – treatments, Gulab jamun premix, Metal powders, Milk powders, Pet foods, Pesticides, Pickles, Pharmaceuticals, Polymer chips, Powders, Salts, Snacks, Spices products, Soya beans, Soups Premix, Starch, Sugar, Thermosetting – Powders, Talcum Powders, Vitamins etc. 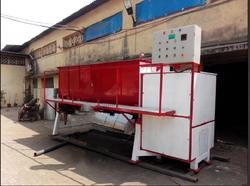 The Blending machine is fabricated in U shaped sturdy body, having top cover and bottom discharge valve, centrally mounted longitudinal shaft on which Spirals ribbons are mounted. Our specially designed spiral ribbons gives the best blending results due to Three dimensional action. Thus every particle comes equally in contact with other particle and get blended equally. The Blender machines are available with options as per customer requirements, having Full Stainless Steel construction (GMP MODEL), OR with contact parts in Stainless Steel and Non contact parts in Mild Steel with Enamel/Epoxy paint (STANDARD MODEL). Improves the consistent quality – Homogenous mixing, No lump formation of Material as minimum gap between shell & ribbons. Add small amount of Liquids – Essences etc. with Spraying System or oil seasoning of various products. Ribbon Blender offered comes designed and developed using latest technology support and allows rotation of ribbons at approximately 70 to 100 meters per minute which allow for optimum movement of material both directions to assure of uniform mixing blends in short cycle times. Further, the system is designed to provide for efficient blending as demanded by the customers. 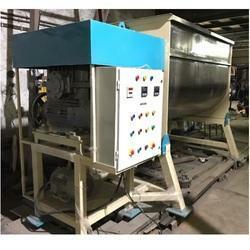 Some of its features include U-shaped horizontal trough; double helical ribbon agitator support; blenders based on proven agitator construction for fast and efficient action; provide support for movement of material within the container so as to avoid dead spots as well as allow rapid product discharge. Ribbon Blender machine is used for blending, mixing various types of powder and granules etc. The machine is idle for mixing spices products, pickles and many types of powders, Granules type products. Ribbon Blender machine can be supplied with attachments such as Heating, Cooling system, Spraying arrangements, lump breaking arrangements etc. Ribbon Blender Powder Mixer offered comes with the support of U-shaped horizontal trough as well as precision engineered double helical ribbon agitator so as to provide for optimum working action. Further, these powder mixers come based on proven agitator construction and meet the demands of fast, efficient blending. Some of its features include the configuration of ribbons precision balanced to provide optimum movement of material within the container; provides for rapid product discharge; paddles positioned to move material in opposing lateral directions & radially; counter-current action to results in homogenous blending.